Last friday, I organized a dinner for a 8 watch friends at my favorite local Italian restaurant called Fratelli (what’s in a name). Great to see that everyone was willing to join, even when having to travel a lot of kilometres across The Netherlands (we are a small country, but with big traffic jams :)) That’s passion! As no one of us had a decent camera with him, we’ll have to do it with this small picture below, taken with someone’s BlackBerry (as the iPhone camera is even crappier). In this picture you’ll see three Audemars Piguet Royal Oaks, of which two of them are 15300ST models and one 15202ST (Jumbo) model. 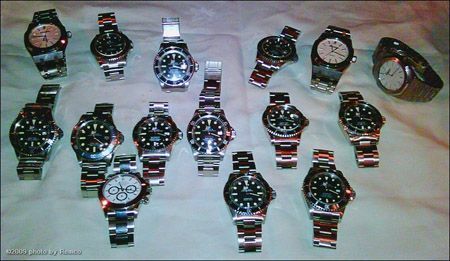 The rest is Rolex, as you probably noticed. A modern Submariner (16610), tritium Sea-Dweller (16600), GMT-Master II (16710) and Daytona (16520), the other watches are vintage. Two Double Red Sea-Dwellers (1665), a red Submariner (1680), a Great White Sea-Dweller (1665), a Sea-Dweller with Rail Dial (1665) and a few white vintage Submariners (5513 and 1680s). Thanks guys for the nice evening! Thanks Zeger for bringing all the nice vintage and new AP brochures!